Life With 4 Boys: Captain America: The Winter Soldier Pizza Party! Captain America: The Winter Soldier Pizza Party! This post is brought to you in collaboration with Lunchbox PR, all opinions are my own. With four boys in the house, I am no stranger to superheros of all shapes and sizes. Their favorites by far are the members of the Avengers, and Captain America in particular. When they found out there was going to be a Captain America: The Winter Soldier, they were thrilled! They were equally thrilled when I was offered the chance to test out some of the latest Captain America toys available at Walmart. Better yet, we were to throw a pizza party with our favorite Walmart Marketside frozen pizzas too. Toys and pizza? Those are music to a little boy's ears. So, I whipped up a Captain America: The Winter Soldier pizza party to celebrate the release of Captain America: The Winter Soldier in theaters and the release of Thor 2 on Blu Ray. The centerpiece of our food table was of course the gigantic Walmart Marketside pizza. They have awesome new pizzas with Captain America and Thor characters on them and a killer Vudu discount offer, but unfortunately, I was not able to find any of those in my stores yet. I did however find our tried and true super sized Philly Cheesesteak Marketside pizza. These things are huge, and more than enough to feed a bunch of hungry boys! Other food items included a fruit and whipped cream tray made to look like Captain America's shield, red, white and blue Jello cups, Avengers themed cupcakes from Walmart, Avenger's themed candy, chips with red, white and blue ranch dip, and patriotic fruit kabobs. To drink, we had both red and blue Gatorade. I stopped by the dollar store and picked up some great Avengers and Captain America themed fillers for the goody bags. They had a great variety of items to choose from. For entertainment, we played with the new Captain America toys available at Walmart, and watched Thor 2 for a little downtime. We were sent four new Captain America toys to test out, and test them out we did. To say my boys are not easy on toys would be an understatement. There was very little assembly needed with any of the toys, and they were all basically ready to go right out of the box. My boys are more active and into outdoor play, so the shield and helmet were the biggest hits, but they really enjoyed them all. This shield hooks around your child's arm and has four easy load darts that can be loaded from the back when the shield is closed. You pull a lever to pop up the mechanism holding the darts, and squeeze the handle in the front to shoot the darts. It is all very intuitive. My 10 year old claimed this right away and popped it on his head. It is adjustable so that it can fit a small child or even an adult. I may or may not have tried it on myself. When he put it on, I was surprised that in addition to shooting two small darts from the side of the helmet, it also glows up with red lights. Pretty cool, and it provides for a variety of creative play scenarios. This turned out to be the least played with toy, but it still got plenty of use. I think it would be great for younger children especially. It comes with a smaller figure on a motorcycle that can be pushed along. In addition, it comes with three shields that can be shot from the side of the vehicle with the push of a button. This Captain America figure is a lot of fun. He is very mobile, and has a shield that attaches to his arm. When you squeeze his legs together, he shoots the shield off of his arm. He also has a button to press that leads to him saying a variety of different sayings. 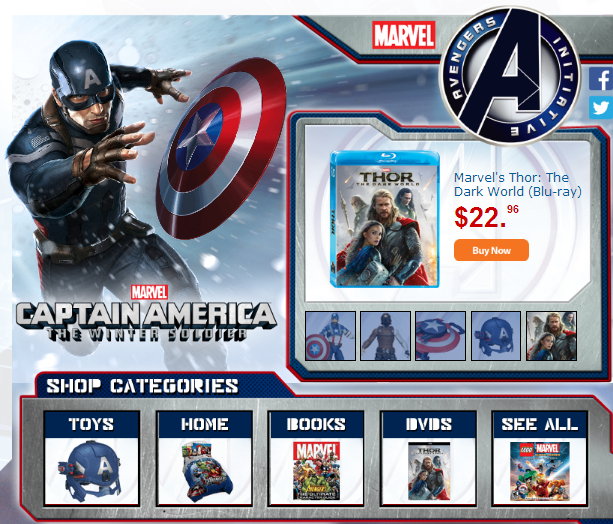 Walmart has teamed up with Disney/Marvel to bring you everything a Captain America/Avengers lover could need all in one convenient place. 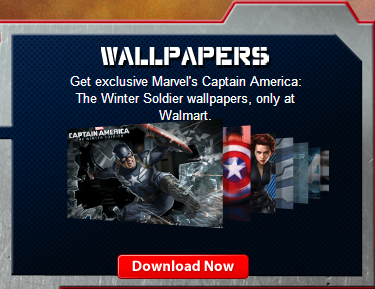 This shopping portal, has access to the Captain America: The Winter Soldier trailer, free downloads of awesome wallpapers, and easy shopping access to everything Avengers from books, toys, movies and items for the home! Stop by and see the great deals available now, and maybe even plan a pizza party of your own! Ummm, I want my kids to be friends with your kids so we get invites to cool parties like this. Wow. You did an amazing job! What a fun party theme!! I love it and it looks like the kids did too. This looks like such a fun party! I love all of the decorations and those jell-o cups look so good! What a fun party! Great theme for boys! I really like the Jello cups. I can use that when Fourth of July comes around! AWESOME theme party idea !! who doesnt' love captain america!! Wow, what an amazing job! What a great theme for a birthday party. Everything looks fantastic! Wow, you are a super mom! What a fun idea for a party! The pizza and fresh fruit look really good! Great party ideas. This is seriously one cool party!! WOW. Look at those decorations and yummy food!! Good job! We are definitely a Marvel family so all this Captain america stuff is right up our alley. What a great party, very patriotic! I love that food table for your Captain America party. Every thing is so festive and could also double for a 4th of July party in a few months!! Super cool, love the color coordination for all the party googies!! What a perfect party for boys! I love the specially themed foods too! What an adorable idea. It looks like everyone had a blast. What an amazing party. I love the fruit tray. It looks so tasty. What a fun party! Those toys look awesome, my son will go crazy when he sees those in stores. Great party! My son would love a Captain America Party. He already has some great toys for his birthday and just got the costume. We've actually had some of the Walmart pizzas. We were very pleased with the price and taste. It looks like you had a great time! Love the decorations and food, it all is so colorful! Wow, what a great party! I remember some of these ideas for our next party. The fruit platter is gorgeous! Oh, wow, your boys are going to LOVE the movie! My son can't wait for this movie to come out. And you are definitely a cool mom for throwing this party! Looks like a fun party for sure!! I love the fruit try and dip that is so pretty!!! The theme is original and I love that!!! Those toys are super fun, and I love that they can battle. What a great party! This is so cool! I especially love your fruit dip shield! That is so creative! We love captain america. And.....the pizza what a cool new way to make pizza not boring, Awesome. My son is obsessed with Captain America, and the rest of us like him too ;) I love your party ideas! 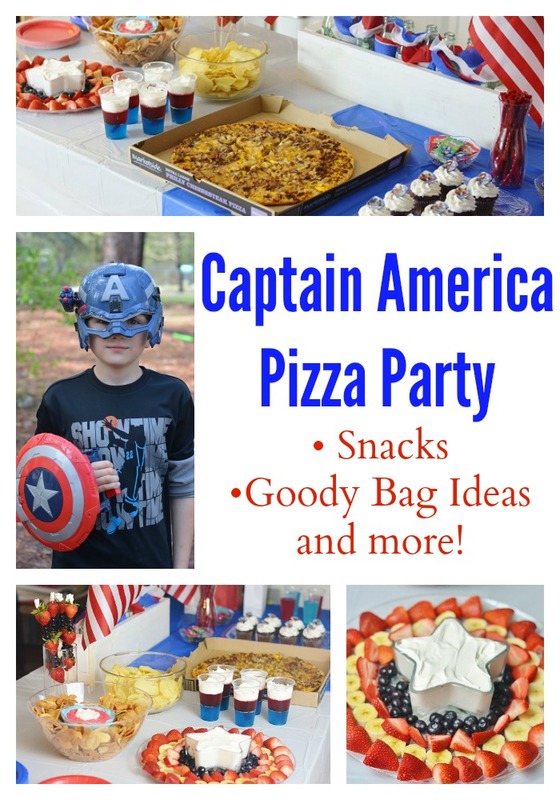 I am pinning this for later -my son may want a Captain America birthday party this summer! Great ideas. I like the idea of a themed pizza party. I've got to get my kids that shield and hat, they love Cap. Okay this is an AWESOME idea. I bet my younger son would love a themed party like this. It looks like they had a great time! Captain American definitely makes a great birthday party theme! That looked like such a fun party! I love how the decorations and everything goes with the Captain America theme. Oh, what a super fun party!! I love all the fun foods and your guy looked like he had a blast with the toys! What a terrific set up. Perfect for a pizza party the boys will enjoy. You did such an amazing job with all the party theme and decorations! I bet the boys enjoyed themselves! You did a spectacular job! WAY to go mom. I love everything that you did. This looks like such a great party! I love all these pictures. I think you put on a great party. This looks super fun! You did a really great job implementing the idea! Love themed parties and you look like you pulled off a fantastic one! All of the food looks especially festive and delicious. This such a cute party. I love the Captain America theme. That looks like it was a FUN party! Loving the new Captain America Toys too - just in time to head outdoors and play! That looks like the most awesome party ever! What a fantastic theme for a pizza party! Looks like a fun party. My son would flip over those toys! Looks like fun. My boys love Captain America. Oh how fun! We did a movie themed party in our home for the Avengers and I made Captain America's Shield cupcakes. The kids really have fun and appreciate it when parents go all out for the things they are interested in and plan parties like this! I love the themed treats you made for them!